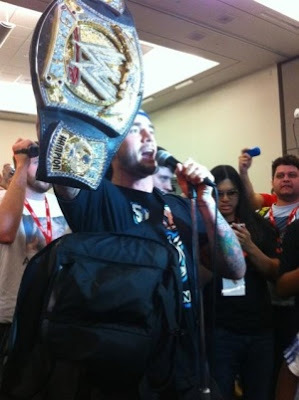 With his handy pipe bomb in hand, the Champ was here at the San Diego Comic-Con for one shocking confrontation. Last Sunday's Money in the Bank PPV was quite a moment in the history of WWE... for the fans. Christian defeated Randy Orton (one way or the other) to become a two-time World Heavyweight Champion, Daniel Bryan is Mr. Money in the Bank (blue version), and CM Punk defeated John Cena for the WWE Championship in his hometown Chicago (as predicted by yours truly)! 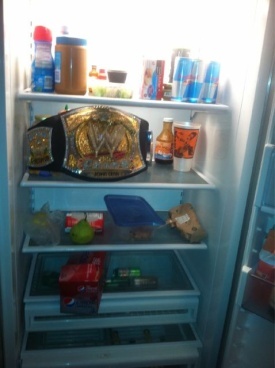 As a fallout from groundbreaking event, Punk remained unemployed yet the prestigious WWE Championship remained in his hands (or his fridge, as illustrated in his Twitter account) while Triple H took over the authority figure role from Vince McMahon, preventing his father-in-law from dismissing Cena for his defeat. While everyone awaits anxiously for any development of this most intriguing angle from the regular WWE TV programming, the plot got thicken in a place nobody would have thought of: Here at the San Diego Comic-Con! 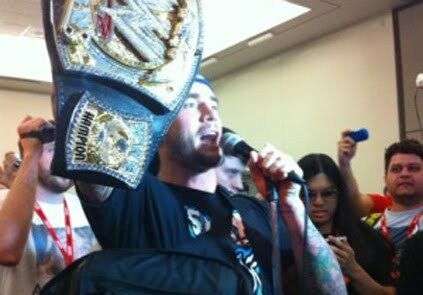 As reported by Matt Fowler from IGN, Punk made an unexpected entrance with his trusty pipe bomb (that's megaphone for us normal people) in one hand, and the WWE title in another. Confronting Triple H on WWE's intention to crown a new champion on Raw, Punk challenges Rey and The Miz, or anyone intending to be the new champion, to head to Chicago for a genuine title shot. Punk then moved on to inquire when exactly is WWE going to put Zack Ryder on TV. When Triple H indicated that there's a new regime running the company now and that Punk might want to talk to him again, Punk responded by claiming that Stephanie McMahon had his number. Punk then proceed to leave the panel. Check out the video embedded below for the most awesome run-in interference in the history of Comic-Con.